Duration approximate: 2 hours with 15 minute intermission. Singer songwriters are musicians who compose it how they like it, original poetry in music. An Actors Studio initiative to encourage creative talent. Food and drinks are allowed in the theatre. Come as you are. Set 2: Izuan Shah | Jasemaine Gan | S.C.A.M. One of the hardest gigging Malaysian indie/underground musicians for the past decade, Azmyl Yunor is also dubbed the “Malaysian Bob Dylan” by peers. A former street musician, he has performed at festivals and venues in countries around the region and internationally such as Australia, Singapore, South Korea, Indonesia, Japan, Laos and Thailand. Although largely still unknown to the public (he likes to keep it that way), he is considered one of the pioneers of the now popular acoustic music scene (which now boasts acts like Liyana Fizi and Yuna), promoting the genre tirelessly as co-artistic director of Troubadours Enterprise (along with fellow singer-songwriters Jerome Kugan and Tan Sei Hon), organisers of the annual Malaysian singer-songwriter showcase KL Sing Song from 2005 to 2009. Continuing to tour locally and internationally in 2010 and 2011 (he is the first Malaysian indie folk artist to appear on Indonesian national television station TransTV in January) to promote his new album “Warga” (released May 2010), he is currently in the midst of recording 2 full-length albums to follow up, one with his touring band The Sigarettes. Uncommon for most underground musicians, he has also shared the stage with mainstream icons such as M. Nasir, Khatijah Ibrahim, and Man Bai, and also plays harmonica in veteran singer songwriter Dr. Wan Zawawi’s band. Singer-songwriter, Min’z (pronounced as min-zee), is a 21-year-old who channels her thoughts and emotions into inspirational and soul-tugging words. Take those words and put them into compositions which carry her very own trade-mark, featuring non-traditional structures, at times adventurous chord progressions and always come with an unexpected twist. Imagine these songs delivered with a spine-tingling voice of sheer unlimited versatility, with dynamics covering the entire range from a tender whisper to banshee-like shrieks and you will get an idea what it is to experience this bundle of energy in a true-to-its-word ‘live’-performance. Her debut-EP ‘Charcoaled Firefly’ (2010) is taking this approach a step further. Min’z presents 8 original tracks with her voice being the centre-point within an enormous variety of aural landscapes. Once she is surrounded by sweet-sounding acoustic instruments (Tomatoes, Sore, Caught Between), guitar-lines running backwards (Are We), next embedded in strange ambient noises and other-worldly choirs (Lies). The listening experience is topped by ‘Fear’, a song driven by a relentless rhythm-machinery and marked by heavily processed guitars and voices; a show-case for goth/industrial rock at its best. Her current single “To See You Go” (2011) is on Malaysia’s FLY FM Campur Chart and Xfm Underground Chart. Remixes of this song by international DJs are now released on Beatport. Scrambling for comparisons from the international stage, names like Damien Rice, Tori Amos and Dido come to mind. Don’t miss the opportunity to experience this straight-shooting new artist presenting herself and her music in a performance far off the mainstream. Warner Music’s songwriter, vocalist of F.O.D. rock band. Izuan Shah composes, plays guitar and sings with the alternative rock collective Auburn, who released their first album, Karya, in 2005. Together with his band mates Izuan has performed Auburn’s original material in electric and acoustic settings both locally and internationally for more than 7 years now, receiving a fair share of modest accolades, fanfare, airplay, film & TV cameos and award nominations along the way. For the past few years he has been a student of the Sekolah Baru Kuala Lumpur (Kuala Lumpur New School), where he continues to receive tutelage from his mentor Loque of Monoloque/Butterfingers, in music theory, composition and thought. At the beginning of 2011, he founded Senisyurga Solutions as an umbrella label for his own artistic/business operations as well as a haven for Auburn’s musical and written works. Though he credits his mother and his wife as his personal heroines from which most inspiration flows, his songwriting influences are drawn from rock performers and musical wunderkinds including Daniel Johns (of Silverchair), Steven Wilson (of Porcupine Tree), Jon Foreman (of Switchfoot), Maynard James Keenan, Van Dyke Parks, Yusuf Islam as well as Loque & Emmett of Butterfingers. Having written songs for the likes of Fish Leong, Michael Wong, Fahrenheit, Valen Hsu among others, Jasemaine Gan is certainly no stranger in the Chinese music industry. Thanks to the influence of Jason Mraz, Jasemaine regularly showcases her songs at local indie songwriters’ gig. Apart from songwriting, Jasemaine also enjoys her role as a Mac Trainer and Photographer. Self Conscious Acronymed Man recently released a debut album ‘Haji Abdul Aziz Haji Ali’, a somewhat violent yet tender collection of thirty nine songs dealing with hate, love and aspects between. The man behind the mask can sometimes be seen in other bands Ciplak, Citizens of Ice Cream and Furniture. Nightlights is a semi comedy project. Although Kit has claimed that Nightlight is a project consist of several anonymous members, nobody has seen Kit perform alongside with any of the so-called anonymous members before. It has always been just him. The factor that pushed the creation of Nightlight is that Kit has always wanted to be a comedian and singer-songwriter but his lack of quality in both of that field held him back. At least until the day he realise he can actually combine that two things into one. And so that’s the story of Nightlights: a sarcastic & comedic folk singer decided to share his over-the-top stupidity with the world. A familiar figure in the local singer/songwriter seen since his return in 2007. His blend of pop/blues and jazz has earned him a thumbs up from local music fans. Known for his energetic and fun live performances, and performed at various shows around town at No Black Tie, Laundry, Moonshine, Celcom UOX PLay, Urbanscapes, ROck The World, as well as the MFestival in Sydney with fellow acts such as Liyana Fizi, Reza Salleh and One Buck Short. He released his debut EP “Revelations and A Cup of Coffee” in 2009 as well. His impressive portfolio also includes a nomination for “Best Acoustic Act” category for the regional music awards Junksounds 2009 and “Best Pop Vocals” for Voize Awards 2009.He is currently writing new material. Rashdan will be accompanied by producer/songwriter Remy J.
Hailing from hometown, Kuala Lumpur; amidst the hustle bustle of the city, this Malaysian-born singer-songwriter considers herself to be a full time dreamer, a part time goof-ball and most importantly a music enthusiast. Priscillia Xavier or Pris, as she is fondly known by her peers, has been singing since the tender age of 12, where she started out as a back-up singer in church. The sound of acoustics and the harmonies of strings has always been a fascination to her; it wasn’t long after that she had decided to pick up her father’s old guitar and spent after school hours, self-teaching herself over the years. Having been in the indie scene for over two years now, this 22-year-old lass now strums to her tunes of Folk and Pop-Blues Acoustic, belting out songs that pretty much sums up her quirky outlook on life and personal experiences in lyrical outpours. To date, Priscillia has performed at various venues in the heart of Kuala Lumpur and Petaling Jaya such as The Listening Sessions @ Italliannies’, No Black Tie, Time Square, The Apartment, The Actors’ Studio, Mist Club, KDU College, Taylor’s College Artista, Ecoba, Comida, and Frontera Sol of Mexico just to name a few. All credit goes to her passion for music as it has always been her main drive and zeal. Believing that musicians play an important role and key influence in the people’s state of mind; she hopes to be able to comfort and inspire her listeners through her tuneful compositions. Joshua began as a singer- ‐songwriter in the confines of his bedroom during one night back when he was 16. It was and still is a facility for his expression – never leaving its basis of its existence. He is blatantly honest about his words but only finds it best when it comes to writing about love, an anchoring theme for most of his 70 songs. Now 24, Joshua is by day a journalist for The Star and when the good ol’ muse hits him on a brilliant night, it will be him, his Taylor guitar and laptop going at it all over again to make another song. Ariff Akhir is a musician, songwriter, music producer and audio engineer from Kuala Lumpur, Malaysia. Apart from performing music as solo singer-songwriter, Ariff sings and plays guitar for The Sofa Sessions and he runs his own music production business, Purple Sound Productions. As a live performer, Ariff has performed at music events in Malaysia, Singapore and the United Kingdom and as a music producer, Ariff has produced and engineered music for numerous local artists, film and television. For more information, please go to www.facebook.com/ariffakhir and www.facebook.com/thesofasessions. Musically he could be considered neither a meat-and-potatoes “singer-songwriter” nor a stump-dumb “rocker” – rather an archetype orbiting freely on the fringes of the blissful expanse in-between. After all, in this day and age would it be wise to pigeonhole one as either? A self-taught musician who went on to be a solo singer-singwriter and started performing in places such as The Apartment, The Laundry Bar, Jaya One and Groove Junction as well as various events such as KLUE’s On The Up and Fete De La Musique, This Is Acoustics Series, The Singer-Songwriters Nite, The Actors’ Studio series, The KLPac Open Day and many others. He has also appeared in The Palestinian Concert that was held live in RTM2 and he has also played in various NTV7 shows. He recently performed for TV2′s Hari Raya recorded concert named “Konsert Generasiku..with Indie Band” using a band to perform two of his own songs. He also plays regularly as a sessionist guitarist for other artistes’ gigs most notably Juwita Suwito. He has begin to create a path of his own definition under an eclectic mix of pop-rock to blues to house and gospel. His songs are written about his passion and struggles and many relate to this. This versatile and well-connected performer is currently a full-time musician and music teacher attached to The StART Society, an organisation that offers performing art courses to underpriviledged kids as well as Alice Smith International School Kuala Lumpur. Besides spending majority of his free time with his PS3, Ian is currently attached with The Kuala Lumpur Performing Arts Centre (klpac), The Actors Studio @ Lot 10 and Penang Performing Arts Centre (PenangPac) as the Group Theatre Manager. As an active member in The Young KL Singers (YKLS) singing the part of Tenor 2, he is currently the Production Director for Young Choral Academy, which administers YKLS and The Kuala Lumpur Children’s Choir. Being a singer songwriter himself, his desire to help budding singer-songwriters by developing new performing platforms has prompted him to produce a series of acoustic gigs since 2005. Via his singer-songwriter involvement, he is also trying to raise awareness amongst Malaysians on the issues of fighting against child prostitution. In 2008, he released his collaborative album “He Says, She Says” together with fellow singer-songwriter Tracy Wong, and recently just released his debut solo album Issues#01. Ian is also an avid guitar pick collector with more than 1,000 over different picks in his collection to date. 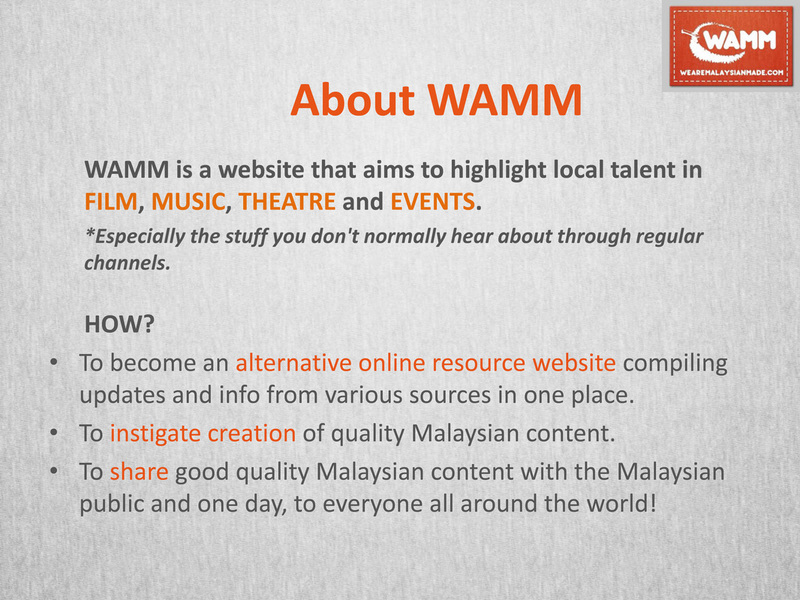 Wani Ardy is a Malaysian creative writer and an independent songwriter. She was born in Kuala Lumpur and raised in Subang Jaya. She identifies her music as acoustic and lyrical poetry. While citing KT Tunstall, Priscilla Ahn, Nick & Liesl, Sara Bareilles, and The Swell Season as her inspirations, Wani particularly singled out Yusuf Islam as her personal idol. 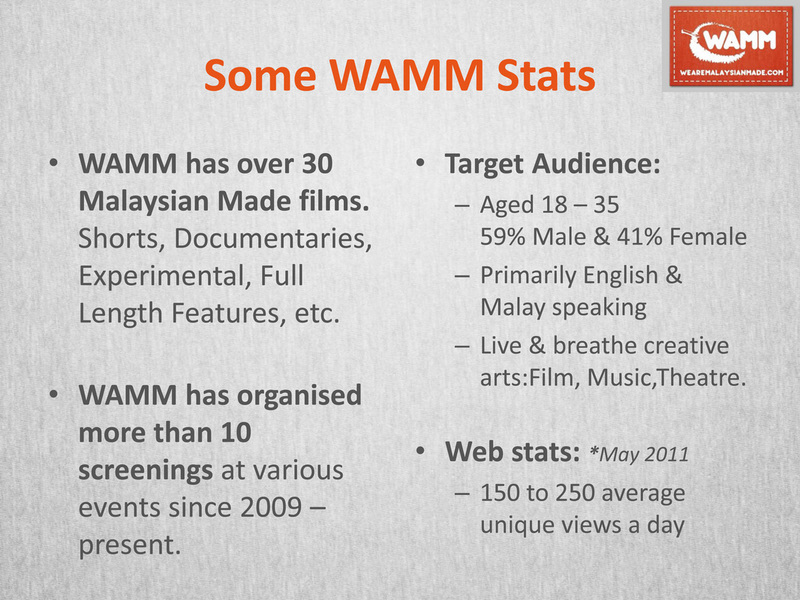 Upon finishing her undergraduate studies in performing arts, screenwriting and film studies, Wani subsequently functioned as a scriptwriter for local television. She then lectured at a private college and later moved on to a public university, teaching creative writing. She has just completed her postgraduate studies and this would be her first performance at KLPAC since her return from Australia. Today, her ultimate musical companion is her percussionist-cellist husband, Syafiq Zakaria. Apart from lecturing, performing, and organizing art events around Klang Valley, she also co-manages a couple of businesses with her husband: Aftertwelve Studio, a live sound reinforcement company, and Gravy Baby!, a Malaysian cuisine restaurant with live acoustic set. Wani has three favourite spots where she loves to write and sing the most: The balcony, the beach, and bookstores. Peter Brown is a singer-songwriter, born and raised in UK. He began writing and performing his own songs in London in the 1970s. During the course of making demos of his songs he met his future wife Markiza while playing in a restaurant in London. Markiza who is Malay had studied music while in school and passed her grade 8 piano. She sang in choirs while studying medicine in UK. They collaborated musically on some tracks, and Peter released privately 3 albums of his own songs Young & Foolish, Wild Place in the Sun and The Searcher. Back in Malaysia Markiza and Hassan Peter played in pubs, nitespots and for good causes like peace, the environment and charitable events. They made two albums in the nineties under the name of PASSION (Markiza’s name means passion fruit in Indonesian), Open Secret in 1993 (released by indie label VSP) and Love & Music in 1996. These albums sold only modestly but had considerable radio play and brought public attention to the duo. After this they gave up the commercial music scene but continue to play for fun and charity, between 1999 and 2010 with their alternative project band called SOFT TOUCH which consisted of Wong Lip Kee (lead guitar) Alda Tan (bass) and Alex Ang (drums). Alex has now left and been replaced by Kevin Theng. to appreciative audiences. He released a solo album “WARM” in 2001 on Markiza and Peter’s independent label Lemang Music. The album was recorded in London and Malaysia. Soft Touch released an album Soft Touch Full album in 2005, consisting of ten original songs by the band, six produced and recorded by Markiza and Peter in their home studio in Damansara Heights, and four live songs recorded at Paul’s Place on Lemang Mobile Studio (see www.lemang.com ) In 2003 and 2006 Soft Touch performed at the annual Rock The World Festival in the Stadium Merdeka. Over the last five years they have played numerous gigs in venues like No Black Tie, KL PAC, Actors Studio Theatre, National Library of Malaysia and many shopping complexes throughout Kuala Lumpur, as well as appearances in venues in London. More recently they have been performing a set of environmental songs about saving the planet and the dangers to the Earth and have just recorded a new single (2010) Like a Polar Bear recorded, mixed and mastered by their guitarist Wong Lip Kee and hope to make a video of this song to be aired on TV channels in Malaysia and possibly throughout the world. Markiza and Peter’s last two gigs (with Wong Lip Kee) were the Doppelganger Open Mic at Palette Palate, 21, Jalan Mesui, Saturday 26 December. On 23 January they performed at the KLPAC Open Day in Sentul Park, Kuala Lumpur. Though better known as a filmmaker, Khairil M. Bahar has been writing songs even before he re-strung his mother’s old classical guitar left handed. Since he came back to Malaysia from his years growing up in England in 2001, Khairil has been steadily performing in the underground and indie music scene, first with ska-punk act Khaimano till 2003 and masked punk rockers Y2k till 2008. His current band, Rollin’ Sixers, have recently completed their debut album (due for release at the end of May) which he recorded and engineered himself. However, every once in a while Khairil can be found at random singer-songwriter gigs performing a few solo acoustic songs whilst attempting to sing which he’s been recording on and off over the past three years. Whether these recordings see the light of day is another story. He was last seen performing his self-penned songs in Life Sdn Bhd 6: Abuse before disappearing into the wilderness to hunt for wild marmots and elderberries. Devon started singing at the age of 5 to the song, Lemon Tree by Fool’s Garden for family and friends. From then on, his interest in music grew and he took up piano at the age of 7 thanks to his parents and grandparents. He started his song writing hobby when he was 10 and wrote more than 100′s of unpublished originals in genres of pop, acoustic, soul, R&B and rap. At the age of 14, he performed on stage in front of hundreds for the first time in a school event and continued performing from then on. He took up guitar 2 years later. Currently, he’s studying Foundation of Music in UCSI University, Cheras. Working as a part time vocalist and musician, he seeks more opportunities to perform and inspire others and also to be inspired.